A music group for babies and toddlers, their grown-ups and care home residents. We sing, move, play, make friends and have lots of fun! Our sessions have been designed by specialists to make them engaging and interactive for the youngest through to the oldest members of the group. Our mission is for everyone to come away smiling, and we mean everyone - tiny babies, on-the-go toddlers, parents and guardians, older residents, people living with dementia, care home staff, our volunteers, the residents' families (who often love to join us)...we all have a great time. From colourful scarves and shakers to bubble machines and action songs, there's plenty to stimulate the imagination and senses. Our sessions are informal and relaxed, giving everyone the chance to participate at their own comfort level. After the music we have Meet & Mingle time - lots of toys, refreshments and time to chat. As parents/guardians and children become regular attendees, intergenerational friendships begin to flourish. 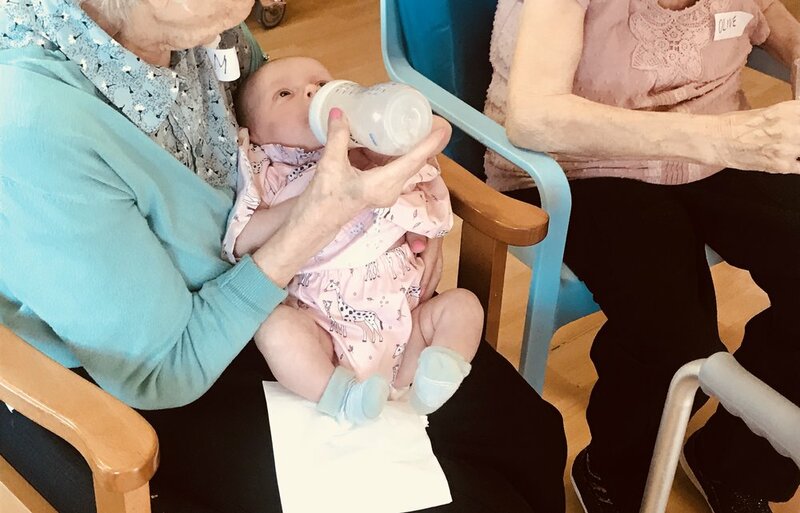 It’s lovely for residents to watch the little ones grow over time, for parents/guardians to connect with new people and for children to have older people in their lives on a regular basis. Watch this space for more launches across England over the coming months. Our sessions are free to attend. However, as a non-profit, we gladly welcome donations to help cover our costs. Either email songs@thetogetherproject.co.uk to reserve a space or book through Hoop (you don’t need the app installed). You can book for one session or multiple ones. A wonderful way to give something back to your local community. By attending with your child, you’re helping to reduce loneliness and social isolation amongst older people – it’s a great feeling! Gives your child the valuable opportunity to interact with different generations, helping to make the ageing process and disability a normal part of their lives. A fun, creative and affordable activity to enjoy with your little ones. Our sessions are aimed at 0-4 year olds, but older siblings are welcome too. Music, playing instruments and singing are a fantastic way to develop your child’s language and fine motor skills. Like our Facebook page, follow us on Twitter or join our mailing list to hear about new Songs & Smiles sessions in your area. A deeply-enriching experience for your residents. Music is proven to have a positive impact on cognitive functions for older people in care homes, particularly those with dementia, whilst intergenerational activities reduce loneliness and feelings of isolation. Affordable and flexible: we tailor our service to fit your requirements. As a not-for-profit Community Interest Company, our priority is ensuring every care home that wants to take part can do so, regardless of circumstance. A life-affirming way to spend your free time, bringing joy and laughter to those in our society who are often most at need. We have a variety of roles, whether you want to lead the groups, welcome families, help with publicity or more. We provide all the training and ongoing support you’ll need. Clinical psychologist Dr. Ariane Zegarra describes the effect that Songs & Smiles has on those taking part, as well as care home staff. David Wood OBE, Chief Executive of national charity Attend, explains why The Together Project's Songs & Smiles sessions are so effective in bringing people of different ages together in meaningful ways. Stephen Burke, Director of think tank United For All Ages, explains why he believes The Together Project will make such an important contribution to our society. For more information on the benefits of intergenerational activities, and of the positive impact that music and singing have in care home settings, take a look at the research from Beth Johnson Foundation, Dementia UK, NHS Scotland and the Local Government Association.